The state of Maharashtra is located in the western part of India, with it being the third largest state in the country. The state covers over an area of 118,809 square miles, shares its borders with the state of Gujarat, Madhya Pradesh, Chhattisgarh, Telangana, Karnataka, Goa and union territory of Dadra and Nagar Haveli on the western side of the state lies the Arabian sea as it bags the credit of parenting the second largest coast line in India, burgeoning and augmenting active aqua Industries and fishing. The state for expedient administration has been divided into 36 districts. The state is mother to the financial capital of India (Mumbai). It is home to one of the largest film industries in the world i.e. Bollywood again located in Mumbai. Maharashtra because of Mumbai by the virtue of it being the city of Bombay, favorable climatic condition in terms of agriculture, fertile land, a mature fishing industry and its bouncy, zealous,energetic,agile,industrious population (including its migrants),boasts of being the largest contributor to India’s national industrial output and tax returns. The state is patently considered to be a rich state but prosperity is predominantly in the hands of few elite, aristocratic, creamy, powerful societal denizen. There is a pronounced fraction in the society paving way to the emanation of class division in terms of economy with a added gist of caste hierarchy Here is where the Marxian historic and economic theory finds its applicability. Marx in his theory very well pointed out that the society is divided into two viz. the haves and the have not’s.His theoretical analysis of the society is equivalent to the arena even after decades. Historic occupations of the people in Maharashtra have been agriculture and fishing. It is the modern era that with number of skilled migrants settling in the state saw a rapid industrialisation. The effluent class started building industries and lended their pasture land to many landless labourers and unskilled labourers for agriculture. In this era when new industries were started we had young politicians who tried their fortune in sugarcane industries the history of sugarcane industry in Maharashtra is synonymous to the history of many of the western Maharashtra rested politicians of the day. The so called “fringe” came to the mainstream. The history of the state is crazily complex as the list of rulers who ruled the land and the diversity they followed in terms of religion, caste, sub-caste is very elephantine.This prolonged history has contributed to shaping the culture of this diverse land. Taking into consideration Maharashtra politics and the political trend that the state has been observing, the Marathas have been dominating the paradise. But the present day scenario writes up a completely different story. With a Brahmin being the chief minister and Marathas asking for reservations, the undercurrents to seek attention and gain power gave Maharashtra its ever first regressive farmer agitation. The Maharashtra farmer agitation is not to be read in isolation but one needs to sight what triggered the protest to such an extent? One can’t demean the fact that the 36 crore loan waiver announced by the Yogi Adityanath led Uttar Pradesh government worked as a catalyst to oil the way for the protest in Maharashtra. The Maharashtra agitating farmers witnessed poring of milk over several of their demands and wasting of vegetables by putting them on fire or dumping it out. The visualisation of such a waste in a very viciously turbulent manner scooped the attention of the entire population of Maharashtra irrespective of caste and class to hear, to see the cry of the poor agitating farmers. The protest left the people with a question mark in hand as they are protesting in a year when the state witnessed a record food harvest contributing to agriculture growth for the entire country to a five year high of 49. The 2016 had a normal, decent monsoon followed by a bumper harvest, which seems to have changed the farmer’s conditions little in the state as compared to the 2014 and 2015 monsoon because of which vast swathes of pulses, soyaben, and cotton crops yielded next to nothing. That definitely took a toll on their ability to repay loans and led to a spate suicide, Maharashtra in 2015 according to the NCRB plonked third of the total suicides by the farmers and agricultural labourers in India. 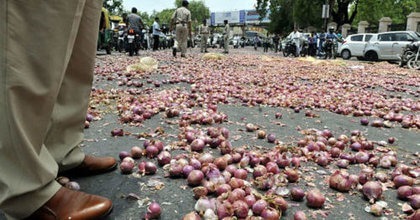 The entire event was given a convincing end by verbalising that the November 2016 demonetization of high value currency led to the collapse of wholesale vegetable prices due to cash crunch forcing many to dump their produce or to sell their bumper Ahar crop at wholesale rates substantially lower than the government announced support price. The entire scenario is well managed, observed and regulated to give it a socio-economic problem of the agricultural class of Maharashtra. But is it actually only the farmers who had decided to play against the government, fight for rights, fight for survival or it is a googly by the oppositions for uprooting the leg stump of the ruling Brahmin led BJP government. Complaint being filled against a local NCP politician by a poor a farmer who wished to sell his goods is one such instance where the role and participation of the opposition in the agitation gets a clear angle. The opposition and the ruling partner of the BJP were pretty confident that the government won’t sanction such a waiver but Devendra Fadnavis not only appealed for a no ball but proved that it was a no ball. The announcement that Maharashtra government would wave off all the pending loans of the farmers shattered the dreams of the opposition of having a by elections in the state. The mammoth decision taken by the BJP led Maharashtra government is politically a befitting decision which helped the BJP emerge as a poor centric, peasant centric party which has set free their capitalist ideology for a long vacation. The decision was a revolutionary decision in the history of Maharashtra. Constructive and affirmative for the agrarian class but has come with a drastic effect on the banks and the working class and their development. The fever which started from Uttar Pradesh now after touching Maharashtra is effecting other agrarian states like Madhya Pradesh, Punjab, Karnataka and some parts of Rajasthan. The trend of waiving off the loans is in a way making the agrarian class strong in its saying but drastically effecting the Indian economy, its GDP and boasting the power of the opposition parties to play more such googlies.